This document discusses Aviatrix Insane Mode (or InsaneMode) performance test benchmarks, parameters that affect performance and how you can turn your environment for best performance. For more information on Aviatrix Insane Mode, check out this link. The iperf3 test is performed between a Spoke VPC instance and on-prem VM. The test setup is shown in the diagram below. The encryption is end to end: between on-prem CloudN and Transit GW and between Spoke gateway and Transit GW. MTU size of all devices in the data path. 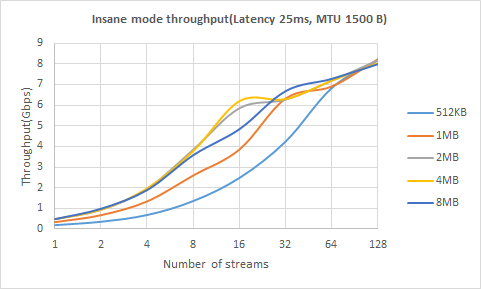 Latency between on-prem and the Transit VPC. The number of TCP streams. 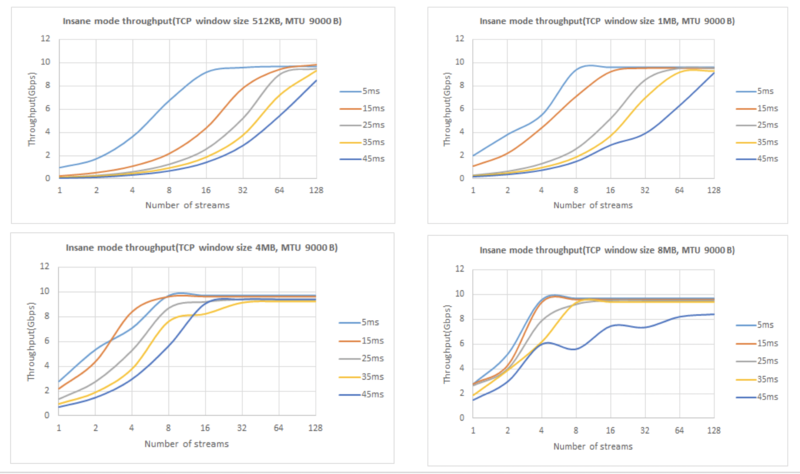 The performance test is conducted between a c5.4xlarge instance in the Spoke VPC and on-prem host machine over a 10Gbps Direct Connect between Transit VPC and on-prem datacenter (Equinix co-lo). The physical latency is 5ms. 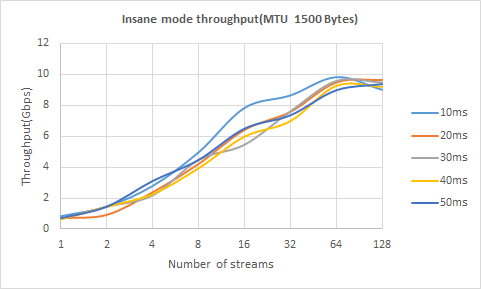 Additional latency is injected into the data path to simulate the latency impact to the end to end throughput. Aviatrix gateways at the Spoke VPC and Transit VPC are c5.4xlarge instance size. Both Spoke VPC gateway and Transit VPC gateway have Insane Mode enabled. Additional performance tests were done for the new c5n.4xlarge. The c5n.4xlarge has significant performance improvements. 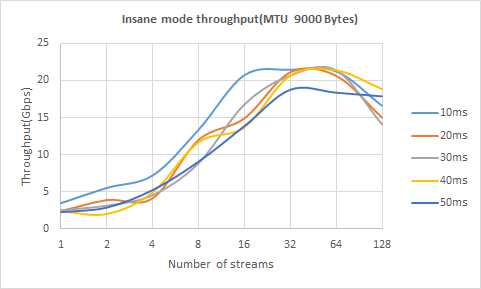 For Jumbo Frame Size of 9000 bytes, the TCP throughput against different end-to-end latencies and the number of TCP streams is shown as below. Use Trace Path. Go to Troubleshoot -> Diagnostics -> Network. Select a gateway and destination IP address, click Trace Path. It should display MTU of the devices along the path. For Linux machine, follow the instructions here to tune TCP window size.